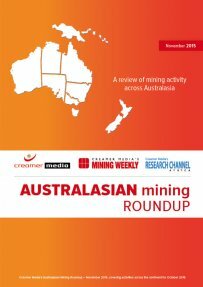 Creamer Media's Australasian Mining Roundup is a business and information tool for decision-makers in the mining industry. This monthly report provides a synopsis of mining activity in Australasia during the past month. The roundup presents the information in an easy-to-read disaggregated format, covering exploration and feasibility studies, projects, operations, corporate activity, general trends in the sector and details of Australasian companies operating in other countries. The November 2015 roundup, covering events in October, includes details of ASX-listed Blackham Resources’ prefeasibility study on its Matilda gold mine, in Western Australia; Canadian company Cameco’s decision to not bring its Australian uranium projects into production until prices improve; and the New South Wales Planning Assessment Commission’s approval of the proposed Terminal 4 project, at Port Waratah. This report is a summary of information published in Engineering News and Mining Weekly, as well as of information available in the public domain, and does not purport to provide an analysis of market trends.